The MaxSpan R.H. thermal hanger shield is specifically designed to provide a superior safety margin for pipe mounted on pipe rollers, flat surfaces or with supports where point loading may be a concern. These rugged units allow hanger spans up to the maximum allowed in Table 3 of the MSS SP-69. They are appropriate for either hot or cold pipe systems. The insulation and factory applied jacketing meeting ASTM E 96A (maximum 0.02 perm) extend beyond the galvanized steel shield for a neatly sealed joint with the adjoining insulation. Units for pipe 4” and larger include a wear/weight distribution plate of carbon steel (primer painted). Additionally, a segment of ultra high density, 900 PSI calcium silicate is fabricated into units for 10” pipe size and larger. The MaxSpan R.H. meets or exceeds the MSS standard for Type 40 Shields per MSS SP‑58, Paragraph 9.2.2. MaxSpan R.H. meets the ASTM E84 Standard Flame Spread -5-, Smoke Developed -5-. For indoor use on all roller hanger systems and flat surfaces (see WeatherShield Upgrade data page for outdoor applications). Chilled to steam piping and dual temperature lines. Hanger spans per MSS SP-69 Table 3. Available for pipes 1/2 inch through 24 inches. Insulation thickness 1/2 inch through 4 inches. 100 PSI Calcium silicate meeting ASTM C-533 Type 1, C-585, C-795, E-84, Thermal Conductivity (‘k’) .40 @ 75˚ F mean. Adhesive complying with NFPA 90-A and ASTM E-84. G-90 Galvanized steel shield, small check per ASTM A-653 (replaces A-527). Wear/Weight Distribution Plate – carbon steel meeting ASTM A-36. Factory applied jacketing meeting ASTM E 96A (maximum 0.02 perm), ASTM D-774, D-828 and E-84. Structural insert (10” pipe and larger) of 900 PSI calcium silicate per ASTM C-656 Type II Grade 6. MaxSpan thermal hanger shields are designed to provide a superior safety margin when supporting pipe with hanger spans up to the maximum allowed in Table 3 of the MSS SP-69 in clevis or clamp hangers. 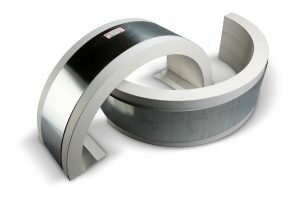 These 360o thermal hanger shields provide a continuous section of insulation and vapor barrier through the hanger and can be used on piping systems operating between +20o F. and +1200o F. The insulation and vapor barrier extend beyond the galvanized steel shield for a neat, vapor-tight joint with the adjoining insulation. To achieve the protection required by long hanger spans, the MaxSpan thermal hanger shields utilize heavier gauge shields, and 450 PSI or 900 PSI structural bottom inserts (10” pipe and larger). The MaxSpan meets or exceeds the MSS standard for Type 40 Shields per MSS SP‑58, Paragraph 9.2.2. These units pass the ASTM E84 Test with a rating of Flame 5/ Smoke 5. For indoor use on all band and clamping hanger systems (see WeatherShield Upgrade data sheet for outdoor applications). Hanger spans per MSS SP-69 Table 3 in clevis or two-bolt clamp hangers. Available for pipe 4 inch through 24 inches. .1/2″ through 8″ pipe – 360° Calcium Silicate, 100 PSI Meeting ASTM C-533 Type 1, C-585, C-795 and E-84, Flame Spread -0-, Smoke Developed -0-. Conductivity (‘k’) .40 @ 75° mean. .10″ through 14″ pipe 100 PSI Calcium Silicate top, 450 PSI Type 2 Grade 5 Calcium Silicate bottom. Smoke Developed -0-, Thermal Conductivity (‘k’) .40 @ 75° F mean. Adhesive complying to NFPA 90-A and ASTM E-84, Flame Spread -10-, Smoke Developed -0-. Vapor barrier of all service jacket meeting ASTM D-774, D-828 and E-84, Flame -5-, Smoke -5-. Structural insert bottom segment (10” pipe and larger) of 450 or 900 PSI calcium silicate per ASTM C-656 Type II Grade 5 of Grade 6. All units and components are asbestos free and 100% made and assembled in the U.S.A.